What is the cost of living in Qatar? Qatar is considered one of the most expensive of the Gulf States to live in, which is not surprising considering it is the richest country in the world (by GDP per capita) according to the International Monetary Fund. The capital of Qatar, Doha, is ranked 158th in Mercer’s Cost of Living Survey for 2014, which is just four places higher than its 162nd place last year, but 91 places behind Dubai in the neighbouring UAE. Prices are expected to rise even higher from 2016 and beyond in the run up to Qatar hosting the 2022 FIFA World Cup football tournament. In our previous blog, we looked at the cost of living in Dubai. Just like the UAE, Qatar imposes zero income tax and very little VAT on goods, which makes the country a tax haven for locals and expats alike. If you are considering living in Qatar, this guide and a lifestyle check may just be what you need. And, as in any other country, the cost of living in the city and/or the capital is more expensive than in other parts of the country. For this guide, we will review the Qatar cost of living and in particular, it's most coveted city and capital, Doha. 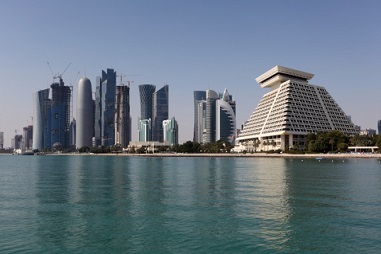 Over the few last years, Doha’s housing market has seen an increase in prices. Half of an expat's monthly income is typically spent on accommodation or housing costs and this is dictated by the location. In Doha, renting a studio apartment in popular locations with a Western feel, like The Pearl and West Bay, can cost at least QAR 11,000 per month. The most popular towers in The Pearl, Porto Arabia and Viva Bahriya, may cost at least QAR 11,000 for a 1-bedroom apartment and QAR 16,000 for a 2-bedroom. Villas, which typically have 4-5 bedrooms, are also popular housing options for expatriates and can cost at least QAR 20,000 per month. However, renting a place in modest locations like Al Wakra can only cost around QAR 5,000 and QAR 7,000 for a studio apartment and a 1-bedroom or 2-bedroom apartment, respectively. Owning a property in Doha is now possible, as foreign nationals were prohibited from owning property in the past. If you are serious about settling in Doha and want to purchase a property, be prepared to spend at least QAR 1,000,000 on a studio apartment and QAR 2,000,000 for a 1-bedroom to 2-bedroom apartment in The Pearl or West Bay. Villas, on the other hand, cost much more and you may have to spend at least QAR 15,000,000. However, it is important to hire the expertise of a real estate firm and a financial planner to ensure that you are making sound decisions. As residents have been feeling the financial stress of accommodation costs in Doha in recent years, some have moved out of the city and settled in the more affordable surrounding areas. So before considering Qatar living, it is important to know whether your company will cover your accommodation. Utility prices in Doha are much cheaper than in European countries as electricity, water and gas are partially subsidised by the government to benefit locals. A single expat living in a studio apartment will spend around QAR 300 on average on utility bills, while it will cost around QAR 700 for a family of four. Expats who live in villas also tend to spend more on utility bills, at least QAR 1,000, as the resources for maintaining such places and the amenities included are costly. It is also important to remember that amounts also differ for different months. Expats may spend more on utility bills for hot months, usually between May to October, while costs are expected to decrease for winter months, usually between November to April. Ooredoo, Qatar’s largest telecommunications company (partially-owned by the government), provides both internet and mobile services in Doha. An 8-Mbps internet connection can cost expats QAR 350 per month, whilst mobile plans range from QAR 100 to QAR 750 per month, and can increase depending on subscribers’ mobile and data usage. As Qatar imports most of its food supply, you may find prices for your usual grocery items to be more expensive than European prices; opting for locally-manufactured goods can be a good option. Also, food expenses in Doha may vary, depending on the kind of lifestyle you are accustomed to. For single European expats, weekly expenses on groceries can cost around QAR 500 on average, whilst a family of four could spend as much as QAR 1,500. There are goods that are relatively more expensive, such as Western products like pork and alcohol, and these can only be purchased from one outlet, the Qatar Distribution Company (QDC). The QDC provides individual licences which must be carried by (and the goods consumed by) the purchaser only. To give you a further perspective, one can compare prices using The Economist’s Big Mac and Starbucks indices to measure the purchasing power in various cities. A Big Mac in Doha can cost QAR 18 or £3, which is the same as a Big Mac in the UK but more expensive than a Big Mac in the UAE. This lower price, however, has come about because of a decision to subsidise McDonald's by 30% for the people of Qatar, as a result of the Emir and his family's love of the fast food. On the other hand, a Starbucks Grande Latte in Qatar costs QAR 17, which is more expensive than one bought in the UK, which only costs QAR 14. If UAE petrol prices are cheap, Qatari prices are even cheaper. A litre of petrol can cost as little as QAR 1.00, which is seven times less than in the UK and three times less than in the US. There is a further advantage in that vehicle prices in Qatar are not that different from UAE prices and are much cheaper than in Europe. A brand new Honda Civic purchased in Qatar can cost in the region of QAR 70,000, which is around 50% cheaper than one purchased in the UK. Luxury cars, like the Porsche Carrera S are somewhat similar in price to the UAE but are more affordable by 20%-30% than in Europe. For expats who are planning to stay for only for a few years but would like to avoid the hustle of public transport, second-hand cars can be bought for as low as QAR 30,000 and cars for hire are also available to rent for QAR 1,800 per month, on average. Doha’s public transport system is not as developed yet as that of the UAE. The Doha Metro Project just entered the first phase of construction and is expected to be finished in 2019, three years before the 2022 FIFA World Cup. The general mode of public transport in Doha is buses, Karwa taxis or private taxis, which can be troublesome and exhausting for expats used to effective modes of public transport. Bus tickets are very cheap, around QAR 2.00-5.00, whilst taxi fares have a minimum tariff rate of QAR 10. Perhaps the second biggest financial challenge for expats in Qatar is the cost of education as well as the difficulty in getting their children into the best schools: most have long waiting lists. Once the decision to move to Qatar has been made, one of the things that should be on top of your priority list, aside from accommodation, is schooling. Ask your employer if your company has slots reserved for employees in the best schools and if there are any education packages you can take advantage of. Once confirmed, immediately apply for a place in your desired school before moving to Qatar, to avoid having to 'homeschool' your child whilst waiting for a slot. Most expats send their children to international schools using the British or American curriculum. School fees for both British and American schools range from QAR 20,000 to QAR 50,000 per child per year. For example, fees in ACS Doha International School, one of the most popular American schools in Qatar, range from QAR 40,000 for preschool to QAR 63,000 for Grade 9 students. On the other hand, Doha College, one of the most popular British schools in the country, can charge as much as QAR 36,000 for preschool to QAR 72,000 for Years 12-13. It is also important to note that registration and extracurricular fees may not be included in these expenses. Due to its relatively large expat population, Qatar is more lenient than many other Arab countries, but its nightlife is still not as relaxed as Dubai’s for example. Just like other Muslim countries, Qatar imposes strict rules about entertainment and alcohol and also observes the Holy Month of Ramadan, when restaurants and bars remain closed until after sunset and will be without alcohol. A dinner for two in an expensive restaurant can cost as much as QAR 1,000, whilst meals in more modest locations can cost much less. Alcoholic drinks can be purchased at most hotel bars in the West Bay area, where expats normally reside. Maintaining a certain lifestyle is one matter to consider, but sustaining it for the future is what you should contemplate. According to the Consumer Price Index (CPI), which measures changes in the price level of a market ‘basket’ of goods and services, the cost of rental, fuel and energy in Qatar increased by 5.8% over the last year alone. Before making decisions about moving to another country, it is always important to review your lifestyle and your capability to maintain the life that you want. Joy Aquino served as a Marketing Associate for AES International before relocating to Germany.